Phase three of the DataVault project is now earnestly underway. Two weeks ago we held the first of our monthly DataVault project meetings, with Mary McDerby and Thomas Higgins (University of Manchester) visiting us in Edinburgh. 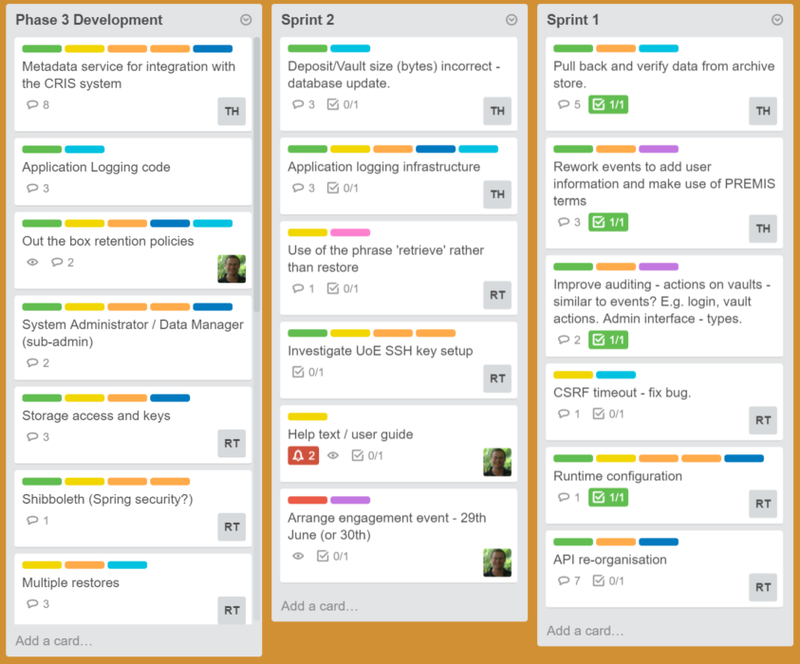 One of the changes we are making to this final six month phase is to move to fortnightly development sprints. In the first sprint (sprint 1) we undertook some rationalisation of the API (as it has grown arms and legs over time), added an enhanced auditing feature (using the PREMIS ontology), added an improved runtime configuration option, and provided better error reporting for a problem that occurs when the CSRF tokens timeout. As always, all of this can be seen in the project’s github account. In the next sprint we’ll be fixing a few bugs and some of the terminology used (replacing ‘restore’ with ‘retrieve’ when getting some data from the DataVault), and adding better application logging.